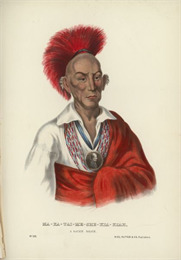 Black Hawk was chief of the Sauk Indians and led them during the War of 1812 and the Black Hawk War. Black Hawk (Ma-ka-tai-me-she-kia-kiak, "Black Sparrow Hawk") was born in the village of Saukenuk, Illinois, on the Rock River near modern Rock Island in 1767. During the War of 1812, Black Hawk supported the British side as a member of the Indian Confederacy led by the Shawnee chief, Tecumseh. During the 1820s leadership of the Sauk tribe was contested between the peaceful, pro-American Chief Keokuk and the aging Black Hawk. In 1830 when the tribe was ordered to abandon its lands on the Rock River, Keokuk complied, but Black Hawk refused. His antagonism increased when settlers destroyed Indian crops and burial grounds. Unprepared to fight for his lands, Black Hawk was soon forced to join the rest of the Sauk in Iowa. The followers of Winnebago spiritual leader White Cloud, or The Prophet, played upon Black Hawk's dislike of Keokuk. On April 6, 1832, Black Hawk and his entire band — including women and children — re-crossed the Mississippi. He was influenced by The Prophet, who assured him that a great Indian Confederacy would form behind him as it had under the leadership of Tecumseh. Proceeding up the Rock River, Black Hawk defied government orders to turn back. With resistance forming against him, Black Hawk soon realized that The Prophet's assurances of Indian and British support were a lie and prepared to turn back. But on May 14, 1832, Black Hawk's flag of truce was violated by a party of volunteer soldiers near Dixon, Illinois. The Indians returned the fire and the volunteers fled in panic. Reports of the event led to an Indian scare throughout the Midwest. Black Hawk, at first encouraged by this easy victory, took refuge in the swamps of the Rock River near Beloit. Several weeks later the Indian band, pursued by militia, volunteers and regular army troops, began a flight northward through Wisconsin in a desperate attempt to re-cross the Mississippi. The chase lasted over two months. Several skirmishes were fought. Many Indians eventually reached the Mississippi near the mouth of the Bad Axe River. When the Indians attempted to surrender, they were met with cannon and rifle fire. The next day the pursuing land forces arrived and more than 300 Indians were killed or drowned. Black Hawk managed to escape, but was later captured near Wisconsin Dells. He was briefly imprisoned, then sent east so the United States government could awe him with its power in Washington. 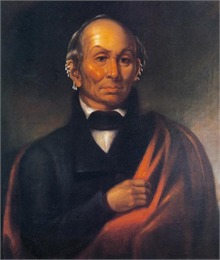 Black Hawk then settled in Iowa until his death. See more images, essays, newspapers and records about Chief Black Hawk.